File this one under what the hell. Video has emerged of a former Comerica Park employee spitting on a park-made pizza. 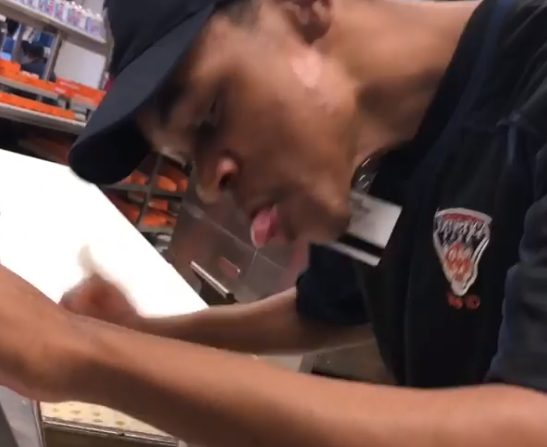 Instagram user _nellmay, not the man in the video, posted the disgusting clip after getting sent home from work for not wearing their Comerica Park shirt. Apparently, much worse things were going on in the kitchen. Regardless of how the video was released, it’s appalling. Thankfully, Comerica Park took quick action with the employee, Jaylon Kerley, firing him. He was eventually arrested. If I’m at Comerica Park, you bet I’m never ordering the pizza again. Kerley’s actions are criminal and disgusting. I can’t fathom what kind of human being thinks its OK to do this type of thing. It’s just gross on every level.